When Londoner Becky Greene moved to Ireland, she was ready for a fresh start - and to leave her dysfunctional family far behind. But when she discovers that she's pregnant, after a one-night stand, all of a sudden she suddenly has more than herself to think about. 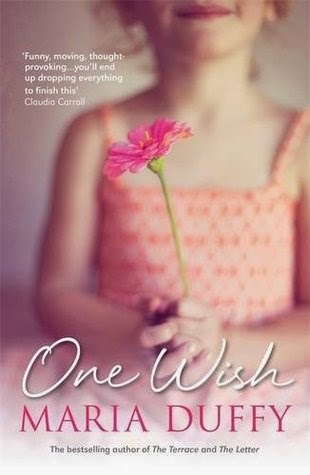 A new author for me, Maria Duffy immediately brought me into One Wish. I was fascinated by Becky’s story and couldn’t wait to find out where she’d come from. As well as being interested in Becky’s life I was drawn to both her friends, Alice and Kate. Each woman had their role in Becky’s story and ended up being a great support system for her as well as each other. Their secondary story-lines were just as well planned and delivered as the main one and brought up several complex issues with simplicity and compassion. One Wish didn’t just explore Becky’s role as a single mother but also delved into the life of Lilly’s father and I was impressed with Duffy’s portrayal of this man who ended up homeless as much by his own lack of forward thinking as the downturn in the economy. It was definitely frustrating that Becky spent so much time deceiving him about her intentions but I suppose that made for intrigue in the plot. Unfortunately, it also made Becky a bit of a pain as she was so entirely focussed on her own difficulties, but I liked the way that she became less obsessed about her job and started drifting into thoughts about Dennis- it made her realistic. While the novel wasn’t filled with gossipy antics and sticky situations I still read it as I would have a lighter novel because it was written to be read with ease. I really enjoyed Maria Duffy’s writing style- can’t wait for the next one!